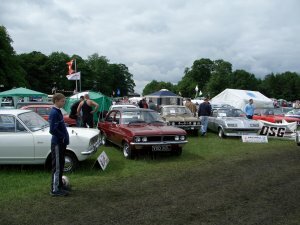 I was pleased to attend a few extra shows during 2005, including my first visit to the VBOA Rally at Billing Aquadrome for around ten years, and the Droopsnoot Group 25th anniversary meeting at Shelsley Walsh. 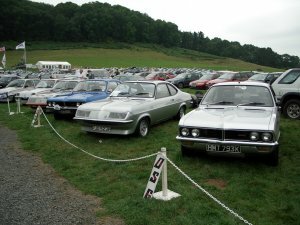 As well as these, I took the car to a selection of local classic car shows. Sandbach Festival of Transport was not held this year, and Chester Festival appears to have gone for good. Set off early for this one, to get down the motorway before the traffic started to build up. Following directions from the sat-nav system I was beginning to wonder if I was in the right place until I saw "Old Nail" on a trailer on a petrol station forecourt. Turned out I had arrived way before anyone else except Paul Sidebottom, who had camped overnight at the track. After a while other club cars started to arrive, in small trickles and then in the convoy where some club members had stayed in a hotel the night before. Turnout was good, with a nice selection of Chevettes (both HS and HSR) and Firenzas, whether HP by name or just by specification. Not a Sportshatch in sight though - where are they all? 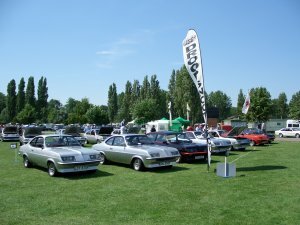 The DSG Marquee got a lot of interest, with the various display boards and videos showing Firenza and Chevette action over the years. Had a good chat with a few people I've met before, and some I haven't. The weather stayed dry if a little grey all day. Here's to the next 25 years! Another bright day for this show, but with a pleasant breeze blowing across the field. A good turnout of cars and motorcycles at this show, and a pretty good autojumble. A very bright weekend saw the DSG and VOC clubs combined again, with a selection of models encompassing the HA, HB and HC Viva models along with HP Firenzas from myself and Barry Carter. Well, I'd like to say how nice the weather was, but I can't. Saturday was a washout, with a brief dry spell during the morning leading to heavy and torrential rain in the early afternoon. For the first time in ages, I left the show early and was home by 2pm. Sunday was a better day, opening cloudy but with patches of blue sky and some sunshine. Turnout was also a lot better, with a selection of American cars and general classics, along with a group of four Routemaster buses. First time I've been to Billing in around fifteen years, and the show has grown quite significantly. The autojumble was much better than I remember, though not so much for my car and a growing number of parts for more modern cars. Spotted a Sportshatch nosecone in the jumble - looks like yet another one has been scrapped. The car performed well on the way down and back, and seems to have averaged just over 30mpg - not bad for a car from the 1970s with a big engine and big carbs! Ran into some old faces and some DSG people I'd heard of but never met. Left early to make sure I was well away before the Grand Prix traffic started (Silverstone is just across the motorway from Billing). Saturday started off quite dull and overcast, and frequent showers led to quite a few exhibitors leaving the show early. The forecast for Sunday gave much worse weather, which actually turned out to be warn and sunny from mid-morning on. The Droop Snoot Group and Viva Owners Club held a joint stand which, by lunchtime on Sunday, was pretty well packed. A few cars we hadn't seen before mixed in with the usual crew for an enjoyable weekend. A mixed day, starting off very sunny but with a couple of quick showers during the morning, but once these had passed the rest of the day was quite sunny. The open spaces alongside the showground mean it is quite exposed to the wind. In addition to my HPF, my local cub stand (the South Cheshire Collectors Car Club) had a variety of interesting vehicles, including the Lotus Elan and Triumph Herald convertible in the picture. The autojumble was reasonable with a few nice spares, but nothing out of the ordinary. This show is really starting to get busy now - for the first time, late-comers had to park outside the main showground as space was quickly disappearing.